Small talk should be kept to a minimum; the draw of the show is the difficult questions and the fast pace. There appears to be too many "glances at the scoreboard". All I want to see is where we are at the end of round one, and two. Nothing else thanks. The studio set up seems to concentrate too much on funky lighting effects as opposed to assisting the way the game runs. What the heck is "Lights out for you?". There's no need for cheesy catchphrases in this show! Why on earth are people coming back for three tries? 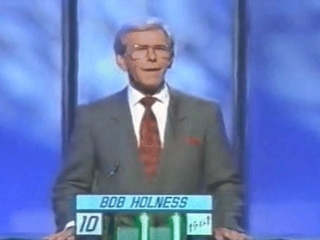 Stewart's game had a strict no-reappearences rule, which, ony a couple of finalists who didn't get a look in when Daphne Fowler and Bill McKaig exhausted the final question set managed to bend. We don't want to see people fail three times. I don't even want to start on what they've done to the theme music. The saxophone in the later series of Stewart's era over-softened what was an excellent theme tune; the 2014 version is positively awful. I still have a great respect for Sandi Toksvig, but she is not suited to Fifteen to One and the new rules make a mockery of it. I've now deleted the series record because the 2014 revival does nothing at all for me. A great TV show rebooted in an awful way. Sorry Sandi; I can't see this one lasting.